Happy Holi 2019: Make sure you or your child do not rub the skin too hard. Our skin gets sensitised when synthetic colours make contact. This will aggravate any skin conditions. 1. Before playing with colours on Holi, apply mustard oil all over your child’s body. Apply generously over the face, hands and legs as these are exposed areas where colour will be thrown. This will keep your child’s skin protected and also help in removing the colours with ease. Alternatively, you can also use a lotion. This is also very effective in keeping yourself clear of colours later, and will clean even the strongest of colours. 2. Before kids go out to play holi soak some multani mitti for about an hour. Then, apply the multani mitti on affected areas. This will prevent rashes in the future. Apply plenty of coconut oil on your child’s hair. This acts as a protecting agent and prevents colours from penetrating deep into the roots. If dry colour gets into your child’s eyes, quickly rinse it with water. On the day of Holi, make sure your child washes the eyes regularly with water. 1. Take half a bowl of curd in two spoons of lime juice. Apply it on the areas having colour and get your child to take a bath with lukewarm water. 2. Ubtan (cream) is another good remedy for removing holi colours. 3. Make sure you or your child does not rub his or her skin too hard. Our skin gets sensitised when synthetic colours makes contact. This will aggravate the skin condition. 4. Don’t let your child go out in the sun after all the festivities. Here are some tips by pediatrician Dr Amit Modi that parents need to keep in mind to ensure their child does not fall ill after playing with colours. 1. It is advisable that kids do not play too much with water or they may catch cold. They can play with water balloons instead of pouring it on each other directly. 2. 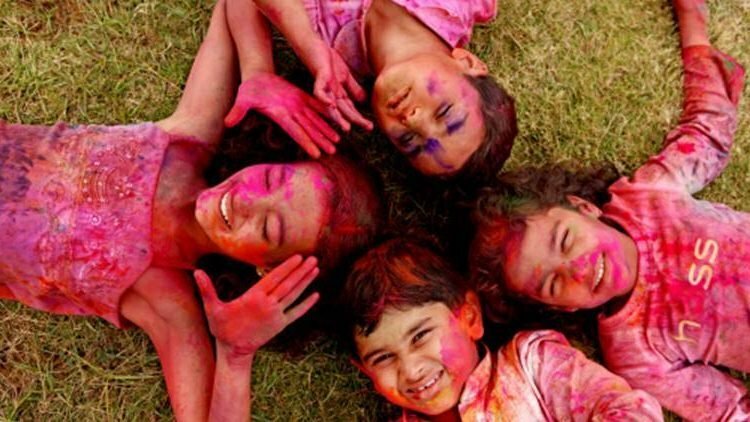 Use organic Holi colours to prevent skin rash. 3. After playing, they should take a bath, only after some time, eat their food and take a nap so that they get some rest. 4. Avoid eating banana and curd or drinking cold water as they can contribute towards respiratory tract infections. 5. On Holi, people indulge in a lot of fried snacks and sweets, which can lead to constipation or gastric discomfort in children. So, it is important to ensure they have enough fruits and vegetables as well. Along with it, they should also drink a lot of water to keep themselves hydrated.